Möbius Strip: A 3-dimensional geometric figure with one side and one edge. A möbius strip is a 3-dimensional geometric figure with one side and one edge. Möbius strip is also spelled 'moebius strip'. 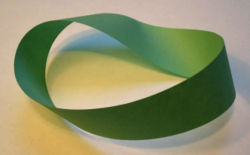 A möbius strip is constructed with a single strip of paper. The two ends of the strip are attached, but one is twisted 180°. If one cuts a möbius strip completely in the middle, it does not make two pieces. The möbius strip was discovered by Ferdinand Möbius (German 1790-1868) in 1858. To build your own möbius strip, print out a copy of this net of a möbius strip and follow the directions. McAdams, David E.. Net of a Möbius Strip . allmathwords.org. All Math Words Encyclopedia. Life is a Story Problem LLC. 3/12/2009. http://www.allmathwords.org/docs/netmobiusstrip.pdf. McAdams, David E. Möbius Strip . 12/21/2018. All Math Words Encyclopedia. Life is a Story Problem LLC. http://www.allmathwords.org/en/m/mobiusstrip.html. Möbius strip: David Benbennick, https://en.wikipedia.org. This file is licensed under the Creative Commons Attribution-Share Alike 3.0 Unported license. https://en.wikipedia.org/wiki/File:M%C3%B6bius_strip.jpg.